The Kingsgate Logistics Union Centre Food Truck Rally was a huge success in 2018 with approximately 10,000 diners! It is one of the TOP 5 Butler County events…Join us! Why do we plan this HUGE event? We do it to raise money for a worthy local cause. in 2017, Heroes’ Fund was our beneficiary. They received over $14,000 for their mission! Our members select our beneficiary organization who must have a local mission and serve a large number of people in our community. For 50 years Big Brothers Big Sisters of Butler County has changed the lives’ of area children through one to one mentoring. Thanks to the generosity of UCBMA and people like you we will be able to create even more Life Changing Friendships through our proven and effective programs. We are excited to have Big Brother Big Sisters of Butler County as our 2018 FTR Beneficiary, and we are honored to be able to help them continue to have a positive impact on our community. 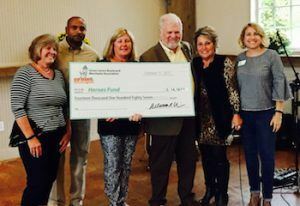 At our New Member Party in October we presented Big Brothers Big Sister of Butler County $15.000 for their mission! 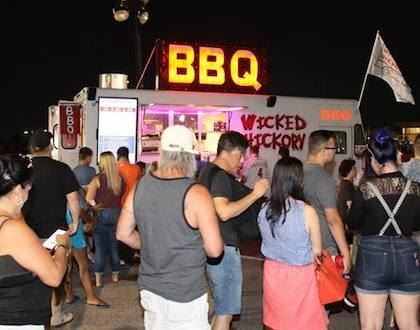 The 2018 Food Truck Rally was Friday, August 10 from 11:30 am to 10:30 pm. As we confirm participating bands and food trucks we will post those details here and on the Facebook page. The 2017 Food Truck Rally was August 11, 2017. To view photos of the event and get updates about next year’s event, follow the Food Truck Rally Facebook page.